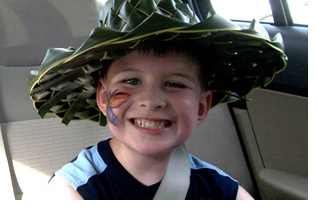 Dylan Jewett was diagnosed with a diffuse intrinsic pontine glioma (DIPG) on November 15, 2008, following a medivac from Guam to the Philippines and an emergency shunt placement. Our once-vibrant 5-year-old became ill overnight. He was no longer able to do the everyday activities we had taken for granted. During the next two months we watched Dylan’s strength become less and less and his smiles and laughs diminish. Dylan’s face turned into a pumpkin as a result of the steroids he was on. As days and weeks passed, we began to realize that God was not going to heal Dylan the way we wanted. We began to understand that Dylan would be called home to be with Jesus far sooner than we liked. We never lost hope for a miracle, but we did understand the reality of the situation. Dylan was terminally ill, and he was losing the battle. My husband and I had several conversations about what we would do after Dylan passed away. Both of us felt there was only one option: to find a way to donate his tumor tissue. Our strong feelings were based on the type of cancer Dylan had. There are no cures for pontine gliomas. Parents of children with pontine gliomas have always been told, “I am sorry, there is nothing we can do but keep your child comfortable.” Radiation is the only treatment offered, but the radiation only buys a child a bit more time – days, weeks, or months. This type of tumor comes back, and when it does there are no effective treatment options. Neither my husband nor I had any prior knowledge of how the donation process worked. Shortly after arriving at Lucile Packard Children’s Hospital to pursue Dylan’s medical treatment, we were introduced to Dr. Michelle Monje. As we talked, I became aware that she was the one I needed to ask about donating Dylan’s tumor. We stepped into the hall, and I began to ask some tough questions. What would we need to do? What is the process like? The most important question to me was: what would my son look like at his funeral service? Dr. Monje promised me that at the funeral no one would know we had donated tissue except us, unless we chose to share the information. Dr Monje was true to her word. At the service Dylan looked like himself. I never saw the scar from the area where they took the brain tissue out. We also donated Dylan’s corneas through the Northern California Transplant Bank. The corneas are valuable, because they allow a recipient to have sight when their vision is going bad. This donation was done at the same time as the tumor donation and did not change Dylan’s appearance in any way. I am so glad we donated Dylan’s tumor to Stanford. We call or email Dr. Monje from time to time and have kept up to date on what researchers are learning along the way. This has helped to give us a better understanding of how Dylan’s tumor has been used to help other pediatric-brain-tumor patients. It has given us hope that we will achieve our goal of a cure one day. I believe God has a purpose for Dylan. It was not the purpose or plan I had for him, but I strongly believe that God used Dylan’s tumor, and is going to use Dylan’s tumor, to find a cure for a brain cancer. Though I wish things had turned out differently, I find great comfort and strength in knowing that my son’s legacy will live on forever because of the donations he made. He will help other children have a fighting chance at a tumor that now just steals their lives. Because of Dylan, other DIPG children will one day fight with new medical treatments. I know the decision to donate autopsy brain-tumor tissue is the hardest decision a parent will ever have to make. No parent should have to make this choice. But, if your child loses a battle with brain cancer here on earth, please consider donating his or her tumor for research. The donation will be used to save another child’s life. As awful as it is for us to have to say goodbye to our beloved child, at least we can help another child be healed through the decision to donate.